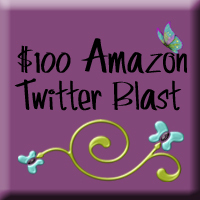 It's Time to Sign Up for a Chance to win a $100 Amazon Giftcode during the Twitter Blast Hosted by Makobi Scribe ~ Just fill out the Rafflecopter Form Below! Everyone loves Amazon Codes. Join Kobiso to win $100 to Amazon? Complete the entries in the Rafflecopter below. You can come back and do a few each day or do them all in one sitting! Good Luck!